One thing in endodontics that isn’t fixable (most of the time) is a vertical root fracture. Two common signs that are associated with vertical root fractures are a “J-shaped” radiolucency, and a deep periodontal probing in the area. These are clues that a VRF may be present, but they are not pathognomonic of a VRF. Since a VRF usually dooms a tooth for extraction, it is critical to arrive at the correct diagnosis. This first case was referred to Dr. Boehne for a second opinion by her friend. The patient was told by an endodontist that the tooth had a vertical root fracture and needed to be extracted. Tooth # 30 was a root canal treated tooth with periodontal probings extending to the apex and a classic J-shaped periradicular lucency. Initially, endodontic disassembly was performed so that the internal root structure could be examined through the surgical operating microscope. No fractures were visible. Although a fracture could not be viewed through the microscope, it didn’t rule out the possibility of an apical VRF, beyond the line of sight. To get a better understanding of the prognosis, this tooth was cleaned out three times over three months. 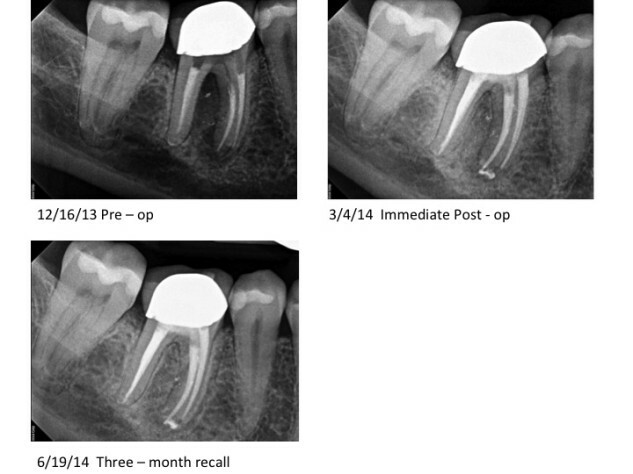 The case was not filled until the periodontal probing returned to normal and radiographic signs of osteogenesis were present. At the three month recall healing is almost complete. The second case (below) did not have a previous RCT, but still presented with a J-shaped radiolucency and periodontal probing to the apex. This patient was worried that her tooth would have to be extracted. This tooth was treated in a single visit while the patient was visiting home from college. EndoVac irrigation technology was utilized as part of the treatment protocol. 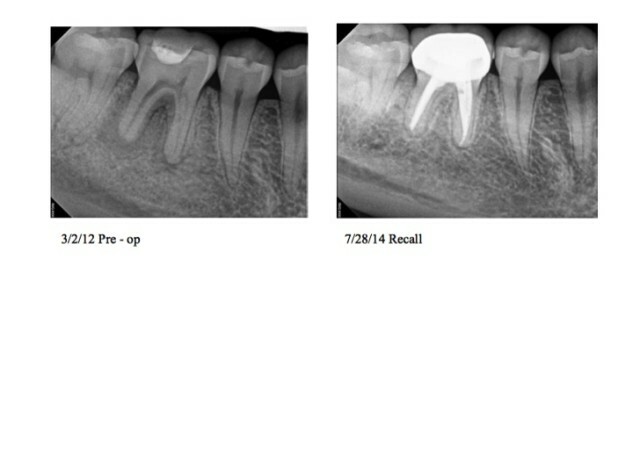 The recall shows how root canal therapy was successful at preserving the patient’s natural tooth.